But although all the R&D is done, with the car even conducting some low-speed trials – the project simply cannot now move forward into its end phase unless the necessary funding is in place. “This is the situation,” explained Andrew Sheridan from FRP Advisory LLP’s Bristol office. “We have a legal entity that has gone into administration because it hasn’t got any more cash. But there is a project there that is very much alive and on the cusp of delivering its goal, which is ground-breaking with leading technology. “However, it does need circa £25m to get it over the line, and that now requires an investor, be that a wealthy individual or a corporate of some kind,” he told BBC News. Why is Bloodhound in financial difficulty? How ready is Bloodhound to go racing? 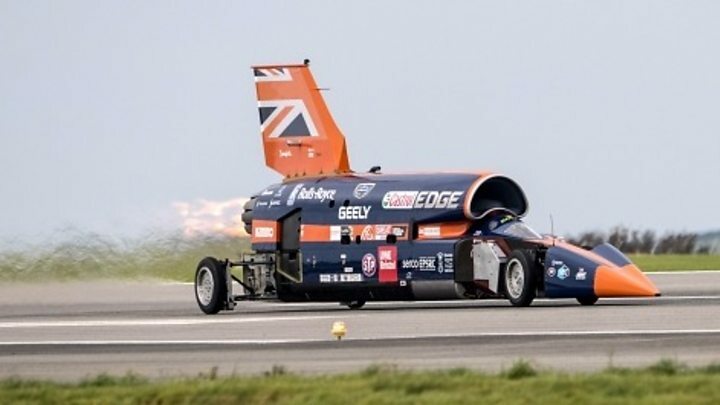 The main structure of the vehicle is built, and last October Bloodhound conducted shakedown runs, topping 200mph (320km/h) on the runway at Newquay airport in Cornwall. The track on which it intends to break the land speed record is also ready to host the car. The Northern Cape Government in South Africa has had an 18km-long, 1,500m-wide section of Hakskeen Pan cleared of stones. And, significantly, the one major element in the technical package that was outstanding has just demonstrated its readiness. This is the rocket that would go in the back of Bloodhound to push it through the sound barrier. Developed by the Norwegian aerospace and defence company Nammo, it was launched to space for the first time at the end of September. The Nucleus rocket flew to an altitude of 107km from the Andøya Space Center. Bloodhound would use a cluster of three Nucleus motors in addition to the Eurofighter EJ200 jet. How soon could record attempts start? If the £25m becomes available, Bloodhound could start running on Hakskeen Pan towards the end of 2019, when the lakebed has evaporated the seasonal rains and the ground has become bone dry. The current plan is to run the car in the first instance in the region of 500-600mph (800-965km/h), using just the Eurofighter jet, to get a better sense of how the car behaves as it approaches the speed of sound. The team would then wait for another rain season to pass before returning to Hakskeen with the addition of a Nammo motor to raise the land speed record above 800mph, and then ultimately to over 1,000mph. So, that would probably mean running in 2020 and again in 2021. What about Bloodhound’s education programme? Bloodhound was launched in 2008 as a “vehicle” to get children excited about science and engineering, and to persuade them of the benefits of entering technical careers. This STEM campaign was one of the reasons big engineering firms got involved because they saw the project as a means to promote their apprenticeship schemes. To date, this “education adventure” has reached over two million children, including 120,000 schoolchildren in the UK each year. The education side of things is unaffected by Monday’s news because it is organised as a charity; it has separate sources of income. The current world land speed record was set in 1997 by the Thrust Super Sonic Car. The UK team behind it was led by Bloodhound’s Project Director, Richard Noble. Thrust’s driver, Andy Green, is also the pilot for Bloodhound.